I'm a music nut who's constantly on the lookout for new artists to listen to, and new gear on which to listen. I love old-school receivers, amps, and speakers, but I'm also into newer tech like wireless. When I'm not writing articles for the Crutchfield website, I'm developing and editing content for the Crutchfield catalog, playing guitar, watching baseball, coaching soccer, or diving deep into the recesses of my music collection. Hanging out with friends, relaxing after work, house parties — all of these things are better with music. 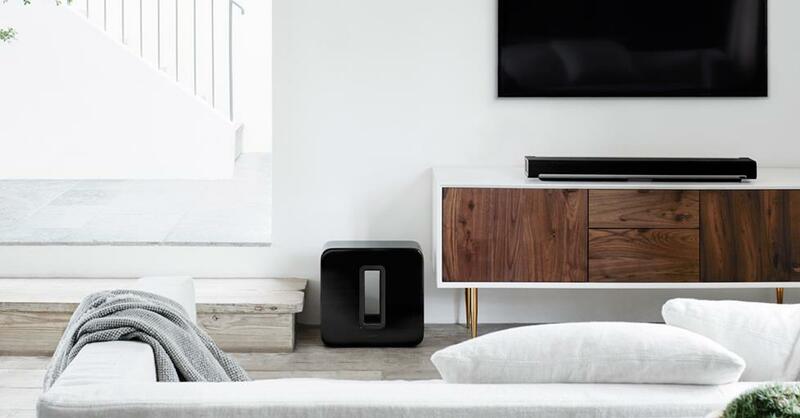 One of the easiest ways to add music to lots of rooms in your house (and one of our favorites) is with Sonos. Sonos is easy to set up and control wirelessly with your smartphone, and it's cost-effective compared to hiring a custom installer. We can help you get started. Read on for advice on what you need to add wireless audio to your life. The Sonos One (Gen 2) has Amazon Alexa voice control built in. Sound: Well balanced sound. Clear detail and expansive sound field. The compact Play:1 is great for smaller rooms. Sound: Very well balanced with tight bass and clear detail. Impressive output for such a compact wireless speaker. The Play:5 is ideal for larger rooms. Sound: Full-bodied, clean and clear, with impressive bass and a wide soundstage that makes this speaker sound huge. 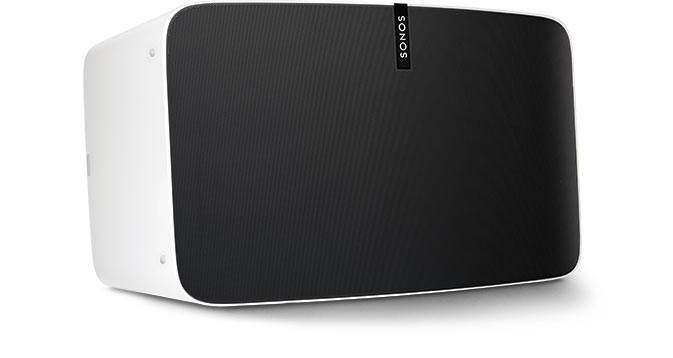 Sonos recently discontinued the mid-sized Play:3 speaker. A replacement for it has not been announced. Please stay tuned. 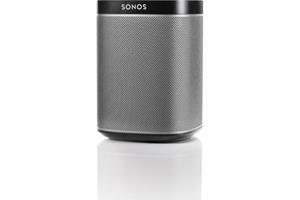 All Sonos speakers can be set to function in stereo pairs, for a wide stereo image and left/right separation. It’s a great option for large rooms where a single speaker may not be enough. Of course, you can only pair like to like. So you can pair two Play:1 speakers or two Sonos One speakers for stereo sound, but you can't pair a Play:1 with a Sonos One. 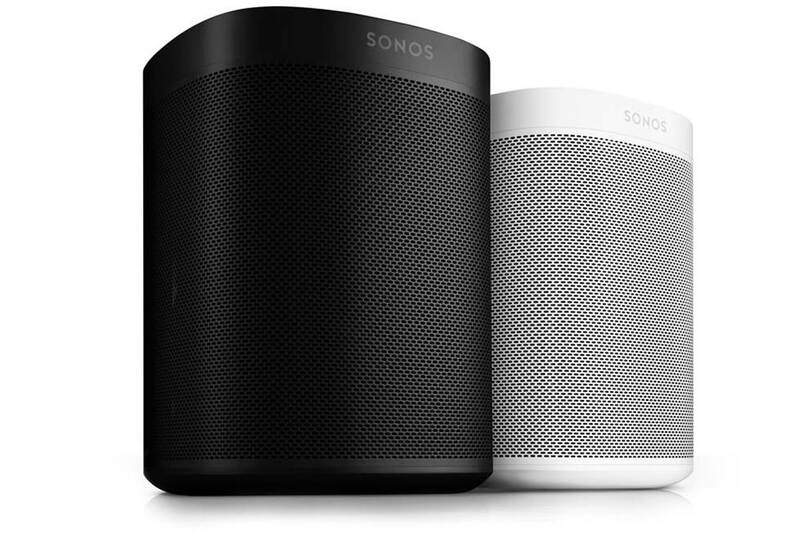 The one exception is that you can pair an original Sonos One speaker with a newer Sonos One (Gen 2). If you’re really serious about excellent sound with plenty of deep bass, we recommend adding a Sonos Sub to a pair of Sonos speakers. The Sub features dual woofers and acoustic ports, so it will fill out the low frequencies. It's great for a system that will rival some pretty nice receiver-and-speaker setups (it's also great for movies and TV — keep reading). You can also pair the Sub with a single Sonos speaker, though we recommend using it with stereo pairs. The Sonos Connect allows you to enjoy all the wireless music benefits of Sonos wireless speakers through your existing stereo system. It offers digital and analog audio outputs, so you can connect it to an integrated amplifier, preamp, stereo receiver, home theater receiver, or powered speakers. 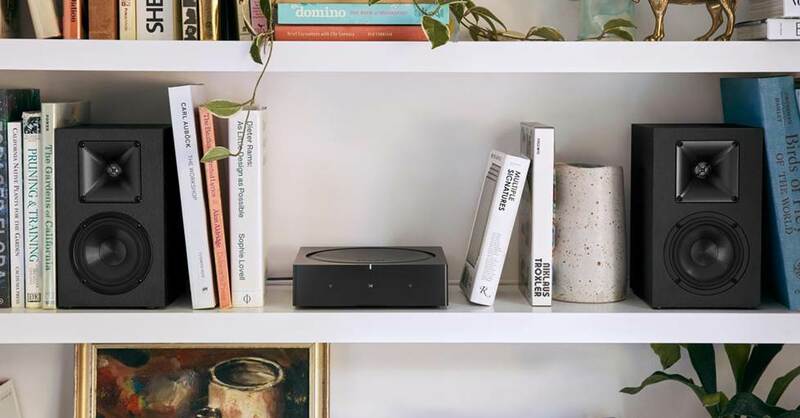 The Connect lets you enjoy Sonos with your existing stereo or home theater system. You can use multiple Connect devices along with multi-room amplifiers to power in-wall or in-ceiling speakers in several rooms. It’s a great way to enjoy music throughout your home while all the gear remains out of sight. To learn more about this, read our article Sonos and a multi-room amplifier, or call our A/V Design group at 1.800.555.9407. The Sonos Amp is an amplified player for use with any pair of stereo speakers. Just connect your speakers to the terminals and start streaming tunes wirelessly. It's a great option for powering outdoor speakers on a porch or deck. 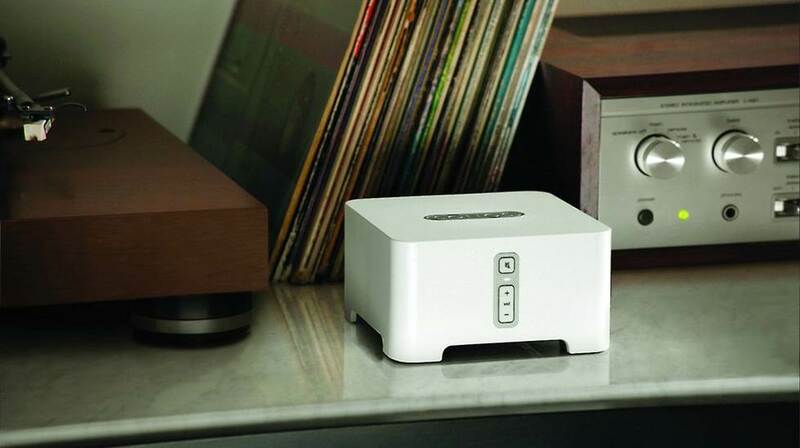 The Sonos Amp also offers analog inputs for connecting a source component like a CD player, as well as a preamp output for a powered subwoofer. Use the Sonos Amp to enjoy Sonos with a pair of stereo speakers. If you want to put together a system for your TV room or home theater, Sonos offers some cool options that offer great sound and wireless music capability. Sonos offers three different sound bar options, each with its own advantages. They can play wireless music from the same sources as all the other Sonos components. And these sound bars let you stream audio from your TV to other Sonos components in your system. Sonos sound bars use an array of built-in speakers to reproduce accurate three-channel TV sound (left, right, and center channels). This ensures clear dialogue and dynamic sound effects. The Playbar makes a great all-purpose sound bar. Sound: Detailed, powerful sound with clear dialogue for movies and TV. The Playbase provides a sturdy platform for your TV. 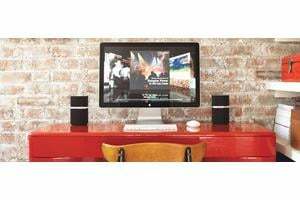 Sound: Spacious, powerful sound with strong bass; clear TV and movie dialogue. 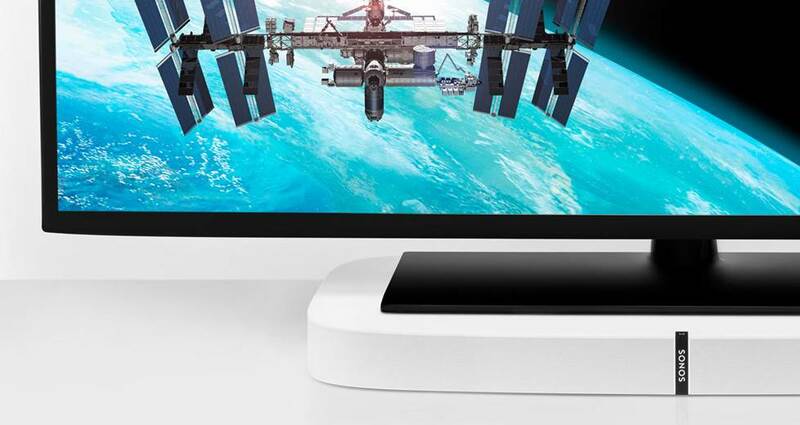 The Sonos Beam is a compact sound bar for simple systems. Sound: spacious, powerful sound; clear TV and movie dialogue. The Sonos Sub can be paired wirelessly with any of these sound bars for 3.1-channel sound in your home theater. The Sub adds dimension to your TV and movie sound by expanding and strengthening the low register. 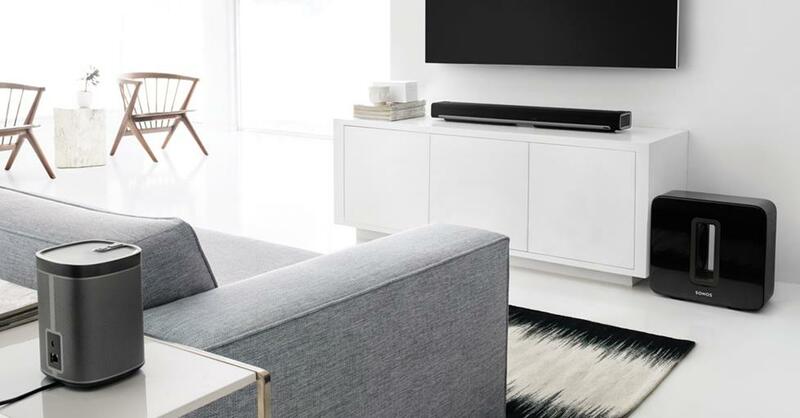 Playbar and Sub — the Sonos sound bar and subwoofer offer dynamic, impactful sound for movies and TV. 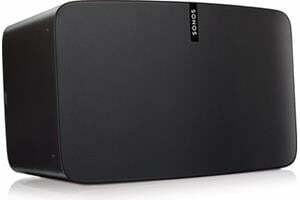 You can use two Sonos One (Gen 2), or Play:1 speakers as surround speakers with your Sonos sound bar. Along with the Sub, this gives you a 5.1-channel surround sound system, for immersive sound in your home theater. 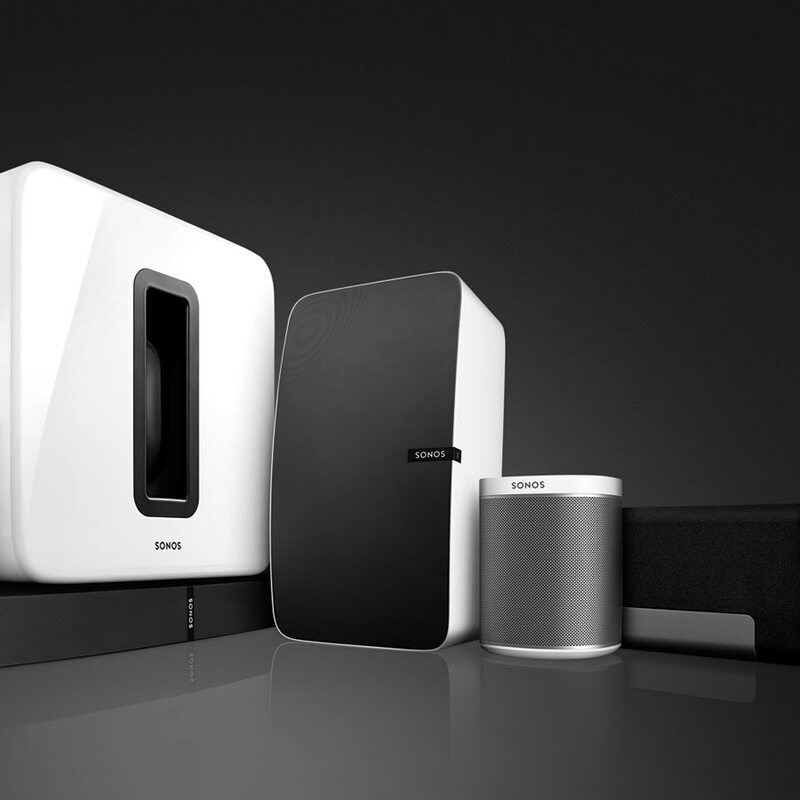 Enjoy a wireless home surround sound setup with Sonos components. Do I need to connect anything to my network router? All Sonos devices now work with your existing Wi-Fi® network, without any hard-wired connection to your router. If you plan on purchasing three or more Sonos devices or wish to place a speaker in a room where your Wi-Fi signal is weak or non-existent, we recommend that you use a Sonos Boost to ensure reliable wireless performance. The Boost is a compact device that connects to your router via Ethernet cable. It creates its own dedicated wireless network for Sonos, without being affected by traffic on your existing Wi-Fi network. The Boost can also expand the range of the network, so you can place Sonos speakers in more rooms. If you're concerned that setting up and using a Sonos system is complicated, let me alleviate your concerns. Few products that we sell are as easy and enjoyable to use as Sonos gear. 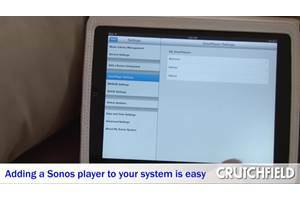 That's why it's been a customer favorite for years, and it's why so many of us at Crutchfield use Sonos in our own homes. 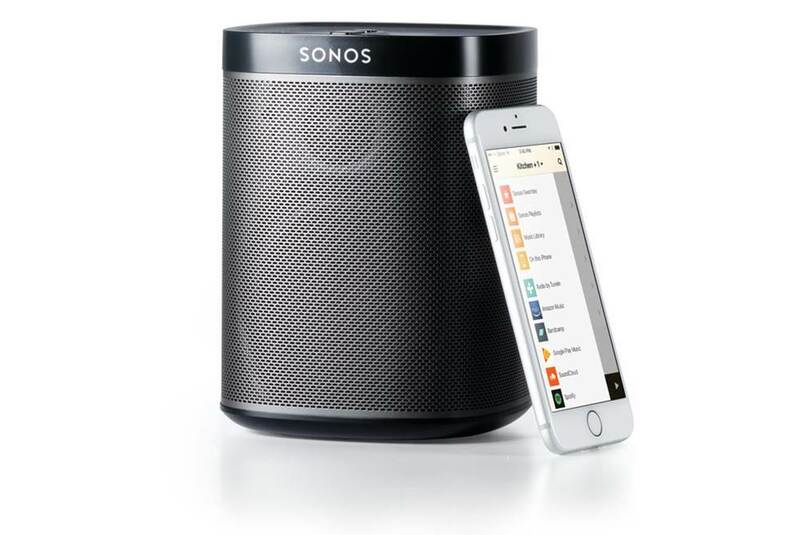 The key to setting up and enjoying Sonos is the free app for your smartphone or tablet (Apple® and Android™ devices). When you first plug in your Sonos speaker, just download the app, follow the simple on-screen instructions, and you'll be listening to music in minutes. Once you've set up one Sonos component, it's even easier to add more. 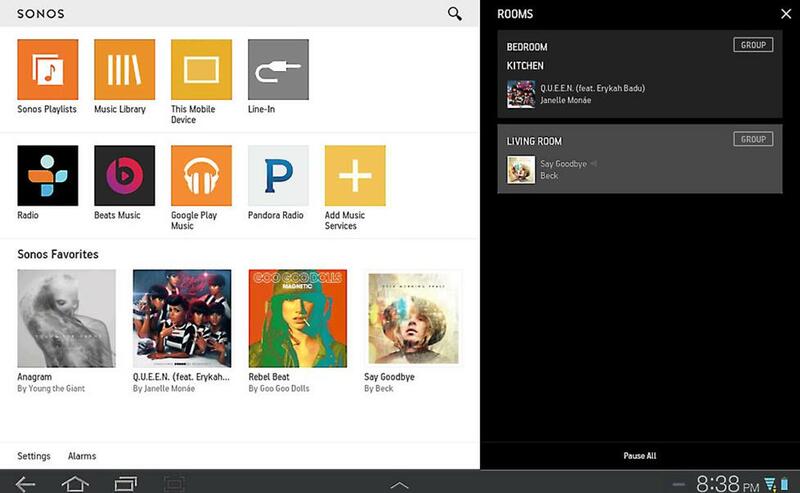 The free Sonos app for Apple and Android tablets (also available for smartphones). You can customize the app to show the various music services you would like to use. You can even add multiple accounts for the same service, so your wife doesn't have to be subjected to your Pandora® stations. Remember: some services require subscriptions. With your music options in place, you can search across all of them simultaneously. Want to listen to B.B. King but aren't sure which album or what's available to you? Just enter the artist name in the search field, and you'll get results from all your music services as well as music stored on your device or networked computers. You can also queue up tunes and create playlists from different listening options. Want to play a new song from Spotify®, followed by an old favorite song stored on your iPhone? No problem. It's another feature that makes the Sonos app such a pleasure for music lovers who are always in search of the right song for the right time. The app also makes it easy to group rooms together for playing back the same song through multiple speakers, or queue up different songs in different rooms. You can easily see what's playing where at any given time. If you use your Sonos control app on an iPhone®, iPad®, or iPod touch®, you can fine-tune your Sonos wireless speakers and sound bars with the Trueplay feature. This free software upgrade deepens your listening experience by optimizing your Sonos speaker for the room it's in. Select Sonos speakers and components come with Amazon Alexa built in. The Sonos One, Playbase, and Beam have built-in far-field microphones to pick up your voice. If you have just one Sonos product with Amazon Alexa built in, you can use it to control your entire Sonos multi-room system with voice commands. With Alexa voice control, you can easily control playback and volume on all your Sonos components. Alexa can also help you search for music and stream different content to different rooms. You can also upgrade your Play:1, Play:3 or Play:5 speakers by adding an Amazon Echo or Echo Dot. There is another control option for Sonos: a universal remote. 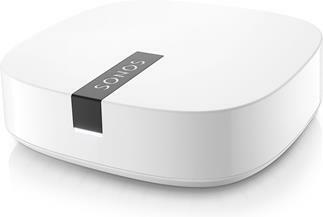 It's particularly useful if you're using Sonos with your stereo or home theater system. Select Logitech® Harmony® remotes let you use either a remote or a smartphone app. These remotes also let you control your entire smart home system along with your Sonos system. Flexson makes stands and wall-mount brackets for all Sonos speakers and components. Check out our article to learn more. If you have additional questions about finding the right Sonos product for your needs, just ask! We're ready to provide one-on-one help with product selection. Give our expert advisors a call at 1-888-955-6000. Les, I'd say that depends on where you have them set up. 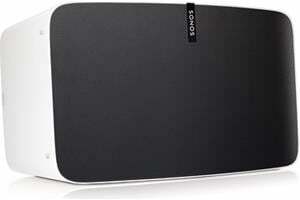 The main benefit to adding another Boost is to increase the range of the dedicated Sonos wireless network. If you're having issues with speakers that are farthest away from your Boost, adding another one to act like a range extender could improve performance. Alicia, I'm afraid you have to have a smartphone or tablet to set up a Sonos system. This is a change that Sonos made to their software recently, which removed some functionality from their desktop controlller app. If you purchased your gear from Crutchfield, you can visit this page to set up a return. Great article.. A few questions: 1) Can I use a sonos connect with ceiling speakers as the rears to a surround system with a playbar as the fronts? 2) Based on what you are saying, it sounds like i can take sound from the TV into the playbar and then distribute that TV sound throughout other zones around the house. I am thinking during a superbowl like party, i want to have the TV sound go throughout the house. 3) Can i have multiple soundbars in different rooms that could be the source for other zones? I am thinking a bedroom playing TV or music sounds into the bathroom for example. Chad, great questions! Here are the answers. 1) You can use a Connect:Amp rather than a Connect to use your ceiling speakers as rear surrounds. There are some specific requirements, which you can learn about here. 2) Absolutely! 3) Yes, multiple Sonos Playbars, Beams, and Playbases can all play different sources at the same time, or the same source, just as in your example. Chad, I'd say it depends on your room size. But for most average-sized family rooms, I think the Beam will do the job. We've seen good reviews from our customers and the audio press that mention the impressive sound output, especially given the Beam's relatively small size. If you find the bass lacking or want surround, you can always add a Sonos Sub or a couple of Play:1 speakers later on. Will the sonos beam be adequate for family room use? Michael, you cannot create a stereo pair with a Sonos One and a PLAY:1 speaker. I have a Sonos One will it pair with a Sonos Play One since I don't need two with Alexa in the same room? Bonnie, Yes! You can use two of the PLAY:5 speakers as rear surrounds with the Sonos PLAYBAR and SUB. Together, they will form a very nice 5.1-channel surround system. You could even save some money and use the PLAY:3 speakers as surrounds instead of the PLAY:5. That's probably more speaker than you need in this setup. I have a sonos sound bar and sub woofer, can I add two 5 speakers to get 7.1 sound or is that not correct, and would make a great system for music and movies ? Jon, that's interesting. We haven't tried to pair a Gen 1 PLAY:5 with a Gen 2 model. But it makes sense that you wouldn't be able to pair them with each other. Given how differently they sound, I think you'd end up with some pretty unbalanced stereo sound if you did. That Gen 2 is powerful! In your review you state that any Sonos models can be paired for stereo sound, I added a Play:5 gen2 to my Play:5 gen1 for just that purpose and was surprised to learn from Sonos that only similar generation models can be paired, i.e., you cannot pair a gen1 with a gen2, only two gen1's or two gen2's. Is that your experience? That said, I love my Sonos system, am listening to more music, and like the ease of setup and use. And with two speakers I get a really large sound stage (if I am using that term correctly) in an open plan area in my home. Ben, yes you can. You just need to run an optical cable out of your TV and into the Sonos PLAYBAR. They you'll be able to hear audio from Apple TV, as well as other sources that are connected to your TV, through the PLAYBAR and SUB. Can I use the playbar & Sonos Sub to play the audio of movies and other media from an Apple TV that is connected to my TV? Hi MB, Yes, you can use two PLAY:5 speakers as rear speakers with the PLAYBAR for surround sound. But this only works with the Gen2 PLAY:5. Hello and thanks for the helpful article. "You can use two PLAY:1 or PLAY:3 speakers as surround speakers with the three-channel PLAYBAR." Can you also use the Play:5 in the same manner? Tara, for songs you've purchased from iTunes that are stored in iCloud, you'll need to either 1) Download the song to your networked computer or portable device; or 2) Subscribe to Apple Music, which is available to stream through Sonos. You can use the CONNECT to power a pair of outdoor speakers. Our advisors can recommend some models that are a good match for the CONNECT. Give them a call and they can point you in the right direction. So one of the comments was you can't use icloud music with Sonos? Does the music have to be fully downloaded on your device in itunes before it will play on Sonos? I see it's not rated for outside use. Could you take a connect, attach it to two outdoor rated speakers? Like the Polk audio ones I see are for sale? Just trying to mentally figure out the best way to do this and cheapest. Thanks. Michael, glad you like the article. And thanks very much for that correction! I've updated the article. CAUTION!!! You will NOT be able to access your music stored on iCloud with this system. Sonos and iCloud are NOT compatible!!! To answer Russell's question, if your internet goes down, you can continue to use the Sonos from local sources. I have Sonos in a work environment that requires music, and we just switch to streaming from iTunes stored locally. Michael, we don't recommend permanently installing Sonos speakers outside. Can I mount a Sonos 1 or 3 outdoors under a patio cover? It shouldn't get rain, and the minimum temperature shouldn't be below 28 degrees F.
Russell, that's an interesting question. Certainly you wouldn't be able to play music from online services like Spotify or Pandora. But perhaps if your home network is still available (just not connected to the Internet) you could stream locally stored music to Sonos speakers. We'll try this and let you know what we find out. If internet goes down, does the system still work? John, I've forwarded your question to our sales advisors so they can email you about your particular needs. Thanks! Lindsey, You can place the Sonos SUB anywhere in your room  as long as it's in your Wi-Fi network's range and you've got a nearby outlet for plugging it in. That gives you a lot of flexibility. Placing a subwoofer is all about the room. In some rooms, it might sound better toward the front, while in others it may be better on the side. Try setting it up in different locations, then put on a movie or some music and just listen from your primary seating location. When you're getting a healthy dose of bass, you've found your spot! I am thinking I want a wireless Play 5 and subwoofer. But I want to have two sources of music; one through my home WiFi network so I can stream from my XBox Music account off my laptop or smartphone, the other connected to my receiver so i can play radio, CD, or phonegraph powered through/by my receiver. What are my options? I purchased the Playbar and the Sub for TV surround. I have space for the player, inside a TV cabinet...but where does the Sub need to be placed ( can't fit inside cabinet) In other wards, how far can sub be from the TV and player? and should it be front of room, near TV or can it be in rear of room? Does it need to be centered in room? Or can you direct me to helpful placement tips?